The RVHPA Board of Directors are comprised of the current year officers, as well as the officers from the previous year. No retiring officers from 2018 are on the current board. Early Woodrat Mtn. top launch viewed from the old knoll before quarrying lowered it to the elevation of the current top launch. Photo provided by Russ Camp. Date unknown. Photo taken at top launch in March 2001 from the location of the old knoll that had been quarried away over 25 years. 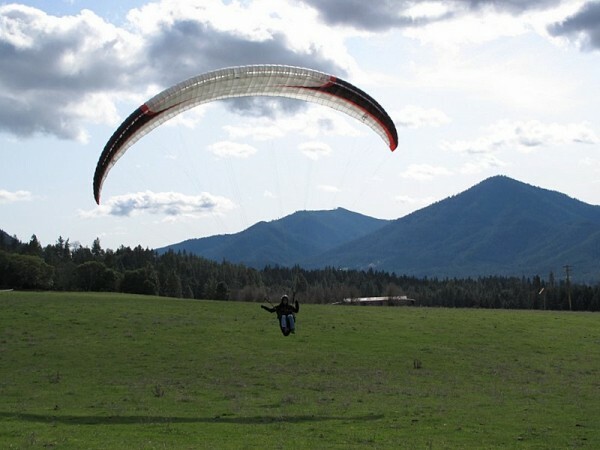 For a quarter of a century, foot launch aviators have been flocking to Southern Oregon to partake in the flying, fun, and fellowship of the Rogue Valley Hang Gliding Association’s Annual Starthistle Meet / Fly-in. After all these years, some of the faces, occupations, locations and partners are sure to have changed. And man, have things changed! In fact, all of us originals, (but one) some how fell out of hang gliding, (How the blazes did that happen?) However, recently, a few of us have been returning. So what better time for a reunion, a “GATHERING”, of the original Rogue Valley Hang Gliding Pioneers. So the word is out, and the gathering is on! Before we continue any further, I am compelled here to mention two men, who, without their dedication, leadership, and example, there simply would not be a Starthistle Meet, an RVHGA, or even a Woodrat flying site. (Well, okay, maybe someone would have eventually discovered it… but then again…) These two might not have been the first to fly hang gliders in the Rogue Valley, (we’re still researching that) but any other way you look at it, Jeff Van Datta and Doug Hildreth would unequivocally have to be considered the “Fathers of Southern Oregon Hang Gliding”. The slot launch at Woodrat’s “official” opening on April 8, 1978. Clockwise from front- Tom Anderson’s Dragon Fly, Paul Nichol’s SST, Bill Shaw’s Firefly, Steve Bissett’s Firefly, Doug Hildreth’s Cirrus 3, Leonard Leslie’s Olympus. 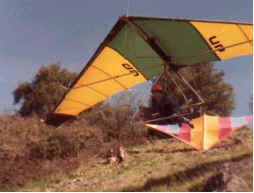 As the first RVHGA president, and operator of “Superfly Hang Gliding”, Jeff Van Datta was the first and only certified instructor in the valley. While Doug’s insightful maturity helped us organize, and find our direction. This created, for us early pilots, a dependable and safe environment in which to learn to fly, hone our skills, and acquire knowledge. Quite unlike the prior experiences that a few of us had. Okay, the true story huh? If you hang glide in Southern Oregon you are likely far too familiar already with the plant we call starthistle. 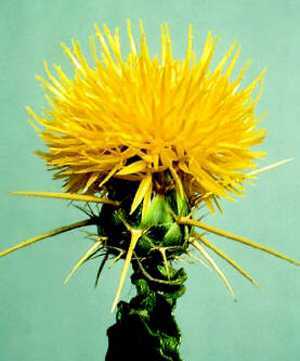 The thistle is a nasty multi-prong thorn looking something like a pointed pick-up jack. Actually it’s nearly identical in shape to an ancient Ninja weapon made of metal. These were tossed by the hand full to the ground, for various effects including to discourage pursuit. The Starthistle Fly-In gets its name from this memorable, thorny plant which is a noxious weed introduced to the Western US from the Mediterranean region. Northeast of Ashland on the lower flanks of Grizzly Peak was our 50′ “Ashland Training Hill” and about a 1/4 mile southeast of that was “Starthistle” our 150′ intermediate hill that was blanketed with the prickly plants. Continuing in this theme was the “Starthistle Bowl”, a 500′ first altitude site directly south of the training hill. Since I didn’t start flying with the RVHGA until August of 1977, I was not involved in choosing the name, but after a few conversations with those that were there, it is as one would assume. The plant’s undeniable presence was the main inspiration, with a bit of the essence of the “stars” in the sky. Besides, it does sound and look pretty cool, don’t ya think? 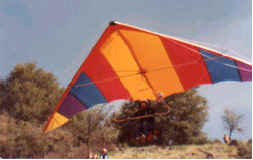 On April 30th and May 1st 1977, the very first Starthistle Hang Gliding Meet was held at Medford Baldy, located east of Phoenix. (We called it Medford Baldy, to distinguish it from Grant’s Pass Baldy) Medford Baldy is an 1800 ft vertical descent site and, as the name implies, pretty much lacking vegetation, other than starthistle of course. The LZ (which was just across the street from Doug’s house) also had plenty of starthistle. With hang gliding being so new, back then, there were two primary motivations for the meet. To better acquaint the other “out of the area” Northwest pilots with our flying sites as well as ourselves, and to give the public an “up close and in person” educational experience about hang gliding. April 8, 1978: Jeff Van Datta Launching the slot on his UP Spider. The competition was held in five rounds: three rounds on Saturday and two on Sunday. The tasks consisted of max L/D to gates, figure 8 turns made through the gate at minimum sink, and a target landing. The flight score consisted of all tasks including landing. Helmets and rating cards were required, but not parachutes. You see, parachutes for hang gliders wouldn’t work. “They would just get tangled in the wreckage…” that is until someone figured out the deployment bag (sometime in ’78, I think). Man! you talk about thorough preflights! In those days (and even after chutes) pilots with gliders with half the complexity of today’s ships would spend twice the inspection time that I see now days. Even though the weather really didn’t cooperate with us (does it ever?) on that first event, we had 40 pilots in attendance from as far away as San Francisco. So the word was out, that the Rogue Valley has “some of the best flying in the state.” Guess some things just don’t change. April 8, 1978: Hiking to the Slot “official” opening. Left to right Steve Bissett, Jeff Van Datta, Doug Hildreth, Leonard Leslie, Ken Hill. Bill Shaw took the photo. In late March of 1978, virtually all flights had been sled runs for months. On one particular day we flew sleders off Medford Baldy. The weather was fair (mid 60’s and clear) and not likely to produce anything better, so we decided to check out the Applegate Valley. The trek included Jeff Van Datta, Doug Hildreth, Steve Bissett, Ken Hill, and Bill Shaw (that’s me). We had in mind checking out a few sites Jeff and Doug had found on the maps. In particular was Tallowbox, it really looked impressive on the topos and more impressive in person from the top. Thinking back, we were standing there towering over the valley as we discussed how it might be flown and how to get around the trees if you didn’t get up, and of course getting permission to build a ramp to make it launchable. Before too long, attention drifted… there at the very east end of the valley was an unobstructed mountain face. A layout much like the famously consistent, Dog Mountain in WA (but without the lake). Well, it sure wasn’t as high as Tallowbox, but it was positioned at the end of the valley and facing pretty much west. So we decided to head off to check it out. I still remember our rigs (gliders atop, just in case) parked along Hwy 238. As we stood there, surveying the setting, involuntary remarks soon uttered forth. “Oh Man!” … “Look at that!” … “That’s gotta work!” Then, as we gazed upward at the mountain, we each started pointing out clearings that could be potential launch areas. Suddenly, someone said “Wait! Is that a Road?” The unison response, “WHERE?” … “At the top of the clearcut.” Out came the maps, and we were on our way. Up to Cady Road, back track south, then west on the BLM road up the back. March 28, 1978: Bill Shaw Launching the slot on his UP Firefly. Cresting the summit and taking in that awesome view for the first time… Well, how would you feel? Besides the view, we’re talking about a 2-wheel drive, BLM road! On BLM Land! Steep! Over 2000 ft vertical descent! Unobstructed! Wind right down the valley and straight up the face! (although there wasn’t much of it that day) And top it off with a whole valley of potential LZ’s! I’m not sure just when the name of the mountain was first read off the map, but I do remember a distinct vibe of mutual disappointment at the sound of “Wood – Rat”. I’m sure we were all kind of hoping for something really cool sounding – like Cougar Ridge, Talon Peak, or Thunder Mountain… But, Wood – Rat? Gimme a break! Course, we eventually got used it. And now, it’s one of the fondest sounds in my memory. The current launch area on the north end of the west face, was not usable back then due to a single towering tree out front. It effectively obstructed any safe flight path. After looking everything over and picking out alternate LZ’s, it was decided that Doug and Jeff would launch from the clear cut road (actually, I think it was a burn). It was nearing evening with barely a breeze. There was only room for maybe three steps, slightly uphill, before a near cliff drop off with stump / brush obstructions to clear. Tricky launch indeed. Steve and Ken chose not to fly. I had only one cliff launch under my wings, so it was “suggested” that I not fly. Man, I really wanted to though and I’m still sure I would have made a successful launch. But with such little wind and not a clear drop, Jeff and Doug weren’t “sure”. So, with respect for their judgment and more importantly, their sincere concern for my well being – I bit my tongue and didn’t fly. Drats! But still, I was there! Jeff was the first to launch, followed a few moments later by Doug. Thereafter, the clear cut road was only sporadically used as a launch. Steve Bissett located a slot in the trees to the far south end of the west face with a 40 degree slope. So, we cleared a trail (to carry gliders through) off the end of the clear cut road through the brush and up the hill to the slot. This became the first “official” launch. So, for all of those keeping track of this kind of thing, the day of the first flight off of Woodrat Mountain was Sunday, March 19, 1978. It was flown by Jeff Van Datta on a UP Spider and by Doug Hildreth on a Cirrus 3. Then, on Tuesday March 28, 1978, Woodrat was flown for the second time (first time from the slot launch) by Bill Shaw and Steve Bissett both on UP Fireflys. 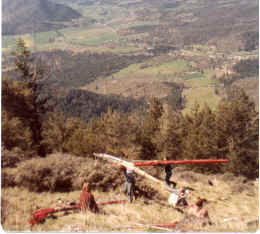 The “official” opening of Woodrat was on Saturday April 8, 1978, after LZ permission was secured. That day we had 8 pilots fly from the slot: Jeff VanDatta, Doug Hildreth, Bill Shaw, and Steve Bissett had their second Woodrat flights, while Ken Hill, Leonard Leslie, Tom Anderson, and Paul Nichols had their first Woodrat flights. Then two days later, on Monday, April 10, 1978, Ken Hill was celebrating his birthday with a picnic on the newly discovered site. The wind picked up, so naturally he had to fly. This flight gave Ken the distinct honor of being the first person to ever soar Woodrat, and on his birthday no less. He flew for about an hour with a max altitude gain of 1600 feet. His log noted “got really choppy away from the mountain”. Like I said, some things just don’t change. Doug Hildreth Launching the slot on his Cirrus 3, April 8, 1978. The “slot” launch was relatively short lived though. Mysteriously, one day, the lone tree obstacle was only about half as tall as it had been. From then on, and continuing throughout multiple terrain changes, the north end has been the launch site of choice. Believe it or not, Woodrat didn’t catch on all that quickly. Probably because we had several sites that were pretty well developed and were closer to where people lived (in Medford and in Grants Pass). In the months to follow we flew a lot, usually as a group, and mostly elsewhere. For the most part SW Walker, Medford Baldy, and Grants Pass Baldy were our mainstays. Also, after checking my log book, I notice that in the following months through that summer we made 4 trips to the Coast, 2 trips to Eastern Oregon, and started flying Tallowbox. Then there was another element to consider, the original Woodrat LZ. It’s still there, looking about the same now as it did then. Same downhill slope toward the same power lines. The tree line and tree height is still about the same. Stop and check it out next time. It’s the last clearing on your left as you head east up Bishop Creek Rd. On approach, it feels like it should be called the Devil’s Triangle! Even with the less performing single surface ships of the 70’s it took a bit of skill, but it was the only place we had permission for. Oh ya, another deterrence was the turnaround. Back in the 70’s, Bishop Creek Road didn’t go all the way through and wouldn’t get you to the top. So at first, Woodrat was just another site. One young pilot that taught us a bit about Woodrat’s potential and consistency, was actually a transplant from Alaska. He moved to the Rogue valley to attend college in Ashland… and to FLY. He had visited here to check things out before enrollment. I guess no other colleges he was interested in had better flying than the Rogue Valley. I remember that about the only place he seemed to fly was Woodrat. Even when the consensus was that conditions would be better elsewhere, we’d often hear he had gone to Woodrat and done better. He was tenacious about finding lift. He would often stretch the envelope a bit and, as far as I know, he never had even a close call. Could it have been talent? I remember he wanted desperately to somehow make his living from hang gliding. And as we hoped he would, he did! His name is Mark Bennett, the world class competition pilot. Over the years, he has been a factory pilot for most of the major manufacturers and has been a regular top finisher in National and World competitions. Another RVHGA’er makes good! The Second Annual Starthistle was held on June 17th and 18th, 1978, with 44 pilots. Followed naturally with the Third Annual Starthistle held June 16th and 17th, 1979. 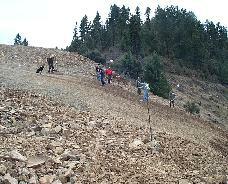 So the first three Starthistle Meets were held at Medford Baldy and were actually pretty large spectator events. We used to get a donation of a buck or two for admission. Then by 1980 two things had transpired. The Hunters had given us permission to use the large field (the current LZ), and access permission for Medford Baldy, which had always been a battle, was nearing impossible. So now, the only other place that made sense for a meet was, Taa Daa… Woodrat! That brought the Starthistle Meet to Woodrat for the first time on July 12th and 13th 1980. Notice we didn’t hold the meets on Memorial Day weekend. In those days, we saved the 3-day weekends for our Eastern Oregon “Thermal Hunts”! Yep, the very same RVHGA pilots that located and developed Woodrat, were also the early pioneering pilots of the Lakeview area. But that’s another story. The first Starthistle was held in 1977. The Starthistle Meet isn’t called Woodrat because it was first held at Medford Baldy, (which is really in Phoenix). Not the Grants Pass Baldy, (which is in Grants Pass). The Starthistle Meet was never held at Starthistle even though there were two sites named Starthistle, just like there were two sites named Baldy. 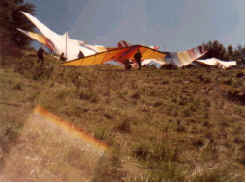 In 1980 the Starthistle Hang Gliding Meet (but not the spectators) was moved to Woodrat which didn’t have starthistles. But it’s all okay, because NOW it does, and everyone flies with a parachute. So I guess some things don’t change, while others do. I wonder what else will change, and what will stay the same? How about if we all meet again for the 50th Starthistle and see. Shall we? “Craig Cox, who flew as a youngster. I recall hearing that he flew every single day for four months straight one year. His family lives/lived in the house to the north of Bishop Creek, just off Hwy 238. Also, Craig Cox holds the Woodrat duration record, something like 8 hours, 30 minutes. Dr. Doug Hildreth might know, as he was one of the very first pilots in Oregon and the RVHGA. I started in 1985. Rodger Hoyt started before me though. Joseph Bova, Terry Tibbetts, Patti Tibbetts, Jeff and Vicki Jernigan, Mike Patten, Doug Hildreth, Mark Holiday, Craig Cox, Jeff Van Datta, and more – all RVHGA pioneers, hard workers, all pilots. Pete Reagan and Tina Pavelic flew Woodrat, with Steve Roti driving. All are from the Portland area. No specific flight reports available. But we are guessing it was good then, too. Pilot Rick Ray landing in Hunter LZ at Woodrat Mountain. This privately-owned LZ is crucial to flying at Woodrat Mountain and RVHPA works hard to maintain this amazing site. * 7 Day Visiting/Special Event Pilot Member – $20 online or at the Ruch Store. Good for seven consecutive days or duration of an event. Please see the Join RVHPA page for detailed information on joining or renewing your RVHPA membership. You can join RVHPA in-person at the Ruch Country Store on Hwy. 238 one mile SW of the Hunter LZ that’s at the base of Woodrat Mountain. If you purchase your membership at the store, then you’ll immediately have your site pass. You can also join online. When you join on line your name will immediately appear on the membership web page. If you join online, you can request that we mail you a site pass and helmet sticker. Membership funds pay for maintaining windsocks in the greater Woodrat area, annual holiday gifts to every landowner whose field we use as an LZ, grading and improving the launch slope, maintaining the parking areas, maintaining the toilet on launch, installing cattle guards on the road, purchasing grass seed for the main LZ, etc. RVHPA spends thousand of dollars a year to maintain the Woodrat launches and the related LZs in the Applegate Valley. Any excess funds are invested towards our goal of purchasing a bailout landing zone. Pilots must be current members of RVHPA and USHPA before using any USHPA insured landing zone’s in the area. Joining requires completing a membership form, paying dues, reviewing the site guide, and displaying and or providing the proper membership identification. All RVHPA members must also be current USHPA members. This is very important for liability and site insurance purposes. RVHPA membership is required to legally land in the primary LZ (aka Hunter LZ), use the parking area along Bishop Creek Road, or land in the “feed lot” field on Bishop Creek Road. Those fields and the parking area are private property. The landowners graciously allow RVHPA members to use them. Non-members who use them are trespassing. Please respect this rule and do not trespass on private property. RVHPA insures the primary landing zones at Hunters Ranch and at LongSword Vineyard. USHPA and RVHPA membership is required to land at these sites unless you have prior permission from the landowners. How will RVHPA know if I am a member? All new and renewing annual members will have their rating and membership type show up immediately on the membership page after completing their online application. Pilots purchasing their membership at the Ruch Store will be issued a membership card (aka site pass) that identifies them as a current member and their data will be put on the website usually within the next week. RVHPA club members and officers will be politely looking and asking for proof of membership. The flying community and the club will also sometimes check memberships in the LZ. The launches on Woodrat Mountain are on public land. How can RVHPA require me to join before launching from land that is freely open to all people? RVHPA membership is not required to launch from Woodrat Mountain, but it is required to land in the privately owned LZs surrounding the mountain and to land in Donato’s LZ Donato, 16km (10 miles) to the east. 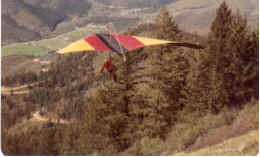 Every pilot who launches at Woodrat is assuming that he or she will land in the Hunter LZ because it is the only LZ within a guaranteed glide of launch. We can fly at Woodrat only because we are welcomed–as RVHPA members–in the only field guaranteed to be within glide of launch. RVHPA membership is also required to use the privately owned parking area on Bishop Creek Road near the LZ. I’m coming for the Applegate Open this year. Do I have to join RVHPA? Yes. If you are from out of the area you may join as a Visiting Pilot, either for one year ($30) or for the event ( $20). Please see our Join RVHPA page. If you arrive at the Applegate Open and have not yet joined RVHPA, you will be able to do so at the Ruch Store or at the RVHPA table during registration. Can I see a list of RVHPA members? Yes. The club keeps a frequently updated current member list on the RVHPA website. Do I have to be an RVHPA member to fly at The Whaleback? No, but we’d love it if you joined RVHPA anyway as a way of supporting our ongoing work and improvement of The Whaleback flying site.